This custom sterling silver necklace with YOUR word-of-the-year hand stamped on it will remind you in a joyous fashion about your true intentions or your soul mantra. A wonderful gift for a dear friend or get one for yourself as an act of self-love. What is a “Word of the Year”? A lot of people set resolutions but that can get messy and disappointing. 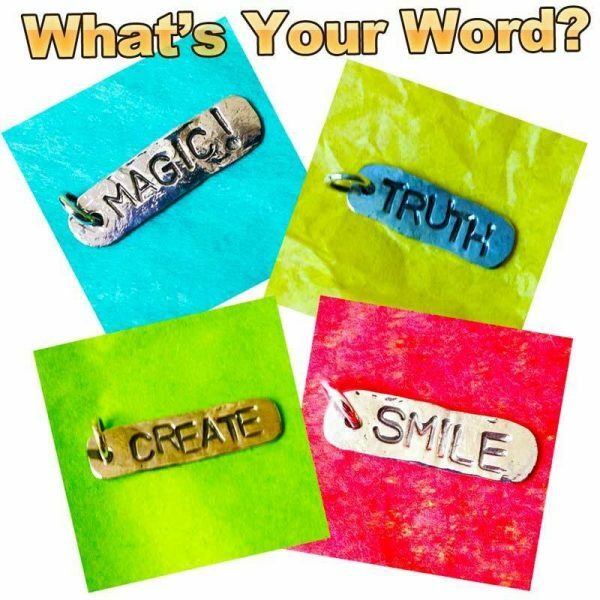 So instead, you decide upon a word that represents how you want to feel or how you want to live each day. Something that lights you up. You’ll know it when you hit upon it. Each necklace is custom made so the letter arrangement will be a little bit different. This pendant includes an 18″ 1.5mm sterling silver bead chain like the one shown! If you choose a word longer than 7 letters, I may need to use a smaller size letter-stamp to fit it onto a reasonably sized silver tag. All of my jewelry is hand forged from .925 recycled sterling silver and made with love and care. ::: As always, I welcome your custom orders. If you want a variation of what you see here, (like making this as a bracelet instead), simply contact me and we’ll plan it together! ::: This particular piece is made to order. Because each piece is a lovingly hand fabricated original object d’art, your piece will look slightly different but it’ll be just as special as the one pictured. ::: PS. If this needs to be shipped internationally I will pay insurance costs but you will be responsible for any import tax. It shipped faster than I thought and was only delayed because of an east coast snowstorm. The necklace is gorgeous and has exceeded my expectations! Beautiful craftsmanship. Thank you Bam!